Synopsis (from the Amazon): For Jewish deli devotees and DIY food fanatics alike, The Artisan Jewish Deli at Home is a must-have collection of over 100 recipes for creating timeless deli classics, modern twists on old ideas and innovations to shock your Old Country elders. Photographs, historical tidbits, reminiscences, and reference material round out the book, adding lively cultural context. If you don’t happen to live near one of the new wave of artisan-style Jewish delis that have sprung up around North America over the last few years, not to worry. With this book, the world of Jewish deli, in all its unsubtle splendor—can be yours in the comfort (and privacy) of your own kitchen. And it’s not that hard. Really. On top of all the Jewish deli classics,The Artisan Jewish Deli at Home offers updates and new angles on the oldways that are bound to thrill the palates of a modern generation of eaters focused on quality ingredients and a lighter-handed approach to a traditionally heavy cuisine. The chapters are organized into: Starters and Sides; Soups and Salads; Eggs, Fish, and Dairy; Beef; Bagels, Bialys, and Breads; and Pastries, Desserts, and Drinks. The range of favorite recipes include: Crispy Potato Latkes with Chunky Ginger Applesauce; Summer Chicken Salad with Tomatoes, Cucumber and Cracklings; Wise Sons’ Chocolate Babka French Toast; Home Oven Pastrami; and Celery Soda. Added cultural context comes from quick-hitting interviews with Joan Nathan and other Jewish food luminaries; histories of a few deli stalwarts such as bagels and pastrami; and first-hand reports from within the walls of the authors’ favorite temples of modern Jewish gastronomy located across the country including: Mile End Delicatessen in New York City; Wise Sons Delicatessen in San Francisco; Kenny & Zuke's Delicatessen in Portland, OR; Stopsky's Delicatessan in Mercer Island, Washington; and Caplansky's Delicatessen in Toronto. 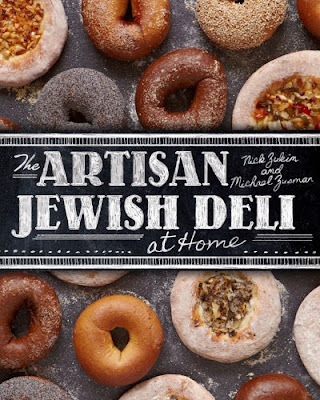 Today we have another unique cultural book called The Artisan Jewish Deli at Home. This book has a beautiful layout and each segment is very well organized. It is simple, yet creative and has gorgeous, pictures. I really enjoyed the information included in this cookbook. It gave us some history and a deeper look into the food we would be making. It isn't just food, but a culture and tradition. The recipes themselves were REALLY easy and detailed. It was easy to follow and is something a person like me could easily do on my own! It even tells you how to keep the food warm while working on other parts of the recipe. It was really wonderful to not be completely lost when trying to make something, I hardly even needed any help. 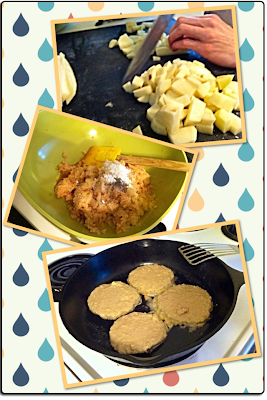 The recipe I chose were the Fluffy Potato Latkes. 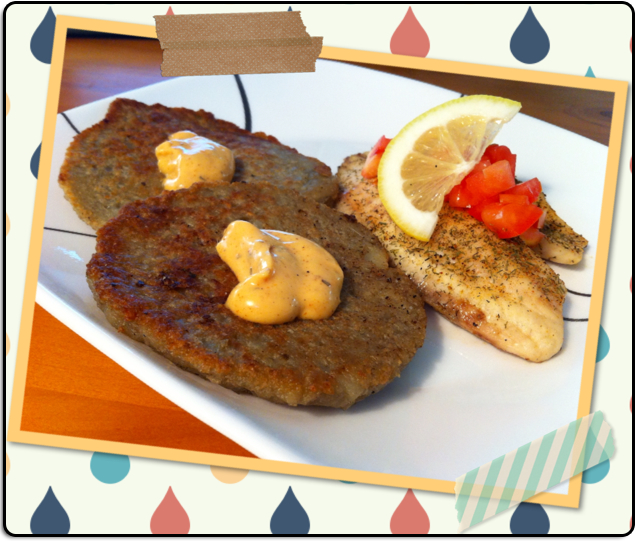 To complete the dish, we made some fish and topped it with our own aioli (mayo+creole+hot sauce), tomatoes, and a lemon slice. They look like sausage crossed with pancakes, but they were extremely delicious. We were also able to make a little extra to take to work the next day. I had some of the girls at my salon try some and they loved it! Unfortunately, this isn't published until September. But I would advise you to preorder it and/or put it on your wish list because this will be a handy book to keep if you want to make something a little different! I, personally, think it would be fun to mix some recipes from this book with the recipes in the Amish Cookbook we reviewed recently. Guess we'll have to try!